I have recently stumbled across a thread explaining that there needs to be an underwater variation of Herobrine dubbed "Ocean Brine." I entered the thread expected a nice, salty ambiance to oceans, and left with dissatisfaction. I know I am not alone. Why not turn this into a potent suggestion? Ocean Brine would be a mostly-aesthetic addition to the Ocean biome. Ocean water is salty, and often you will see beautiful crashing waves along the beaches of said oceans. 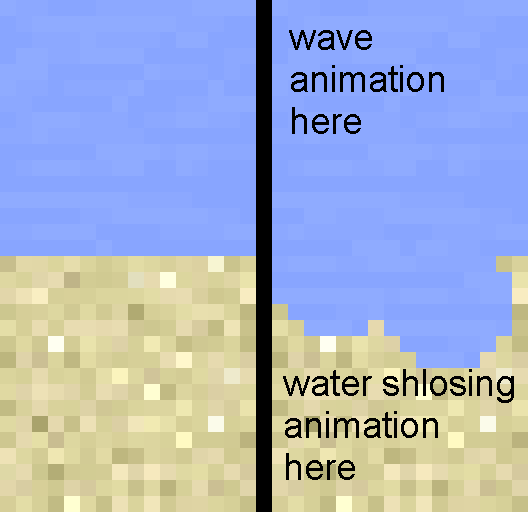 Minecraft is certainly a game where visual beauty comes into play, and I believe seeing some wave particles, even if small, atop the surface of beach water would be a swell addition. So, yeah, this isn't an addition to oceans, but rather to beaches. Earlier I stated this was a mostly-aesthetic feature. The only gameplay-enchancing value this is a fairly important one. What the hell is the difference between that giant lake, a horizontally-challenged river, a worldedited sphere of ice that melted, and an ocean? How can we tell if it's an ocean? The answer is simple. Ocean Brine. Evidently, this suggestion is far from finished. How often does it appear? Is it affected by bordering biomes? What color is it? Does it move the player? How does it affect mob spawning? Does it? These are all questions that can be posed by you, discussed amongst us, and added here, to the OP. I look forward to your feedback and contributions. How can we tell if it's an ocean? Press F3, and if we're in the Ocean biome, it's an ocean. If it's a River biome, it's a river. All silliness aside, as I mentioned in the thread you linked to, I think this is an intriguing idea. While it's mainly an aesthetic feature, it's possible that salt, seaweed, and other things you would find in an ocean be implemented specifically in that biome. From a coding perspective, perhaps salt levels could be coded similarly to light levels (the further from a "salt water" source block, the lower the salinity level). Or maybe another method could be used. At the current time of 1:30 AM, I haven't had a chance to think about it with a clear head. Anyway, I stray from the original point. This is an interesting idea, and if I'm not mistaken it's easily doable. I honestly find the whole idea of salt and salinity levels very interesting and I would love to see them in the game, but I don't think Mojang would bite down. It's a big change to add blocks, mobs, and entities (let alone a new system akin to lighting), one that would probably not make it. I would die to see something of that sort as a mod, though, and I would also like to hear how you think the salinity system would work. Perhaps create your own thread? I was trying to get oceans to look nicer with water CTM for waves at the edges, but no luck as CTM doesn't work on water. Also CTM only works on blocks of the same kind, so no detecting if something is near it. Would look very nice though. Perhaps I'll look into writing it myself if there's enough interest and I can find the time to do so (and I can figure out how to get it to work), haha. -Differentiate between fresh water and salt water in the game's code. -New water bucket items will have to be created, although I can't foresee much difference in the way they'll be used. Perhaps fresh water will be lighter in the sprite for the "fresh water bucket" item, as opposed to the "salt water bucket" item. -Salinity will be measured on a scale of 0-15 (similarly to light levels), with 0 being the lowest salinity level and 15 being the highest. -Salt water source blocks (water with salt levels higher than 7) would generate in oceans. Fresh water blocks would generate in any other biome, and river water salt levels could be somewhere in between, depending on the river's source. -Sugar cane will not grow adjacent to water with a higher salinity than 5. -In water with a higher salinity than 7, the player will heal damage more quickly. I really like the idea of getting salt from cooking the salt water bucket. The only question is this: what could salt be used for? Salting rotten flesh to produce something edible...? I like these ideas, but I think calling this the "Good Version" is a bit pretentious and unnecessary, seeing as the other one will get ignored/locked soon. Yes, the whiteness of the water is reflective of that, which is why it's only seen in ocean biomes. I think swamps should have "saline water.'' which in minecraft will be light blue water. this is a reference to the ocean brine mod, a horrible idea of a shark-like herobrine. I think that is a neat idea. I support. OKAY ITS A GOOD IDEA. EXCEPT IT NEEDS ONE THING MAYBE SEAWEED. brackish water is generally the term for mangrove swamps, but the possibility of having inland swamps being fresh and ocean side swamps being brackish. Could potentilally add a new biome with mangrove type trees and their knobby knees. I am all for inclusion of water plants, both fresh and salt species and oceanic corals / fish. Oceans lakes and ponds are so barren. Sounds good, but ocean brine has nothing to do with waves. Edited the title for the purpose of sense-making. But what does an Ocean Brine have to do with wave particles?